Old Testament, display books with or without Strong's numbers. 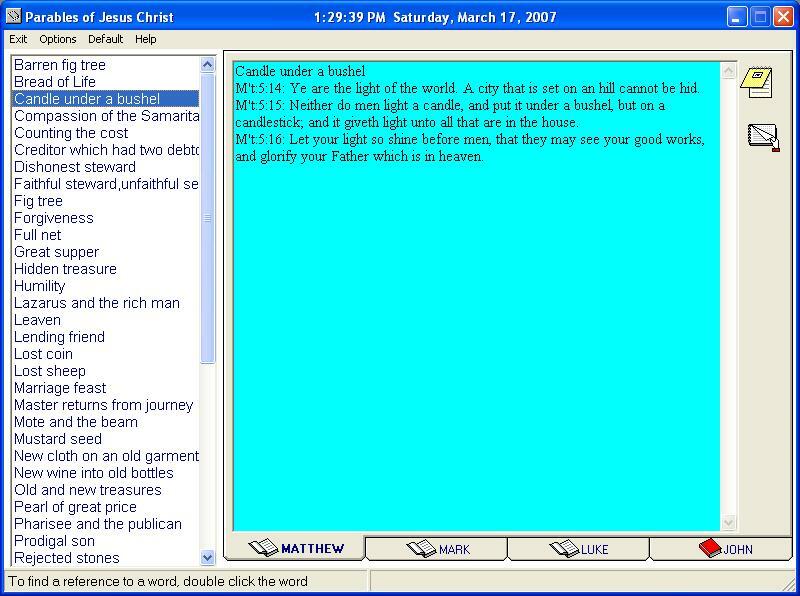 Menu's to maps, search, create a word dictionary, book mark, change font or screen color, dictionaries, internet favourites, Messianic passages and topics. DblClk a word or number and the dictionaries will be searched. Old Testament topics can be displayed by book or all. They can be sorted, generated into a text file and viewed. The topics use every passage of the Old Testament. DblClk a word and the dictionaries will be searched. New Testament, display books with or without Strong's numbers. Menu's to maps, search, create a word dictionary, book mark, change font or screen color, dictionaries, internet favourites, Parables and topics. DblClk a word or number and the dictionaries will be searched. 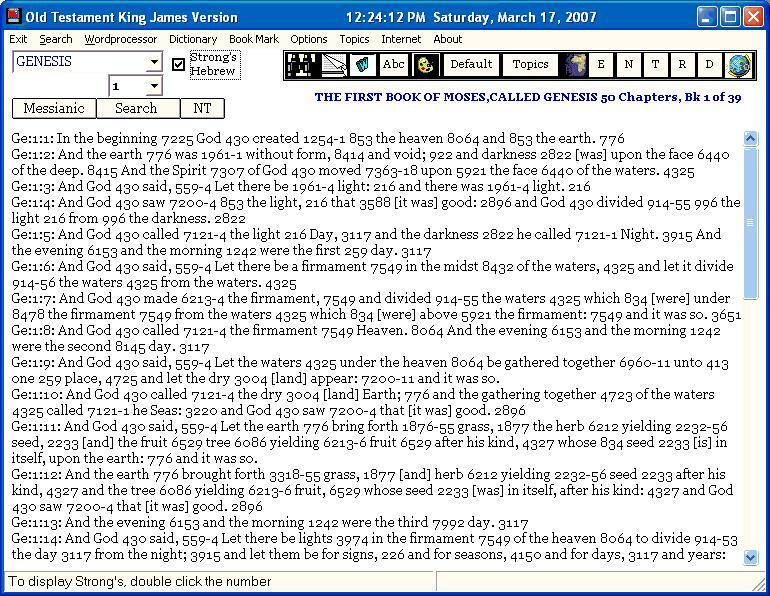 New Testament topics can be displayed by book or all. They can be sorted, generated into a text file and viewed. The topics use every passage of the New Testament. DblClk a word and the dictionaries will be searched. This tabbed screen display Easton's, Tories and Naves. 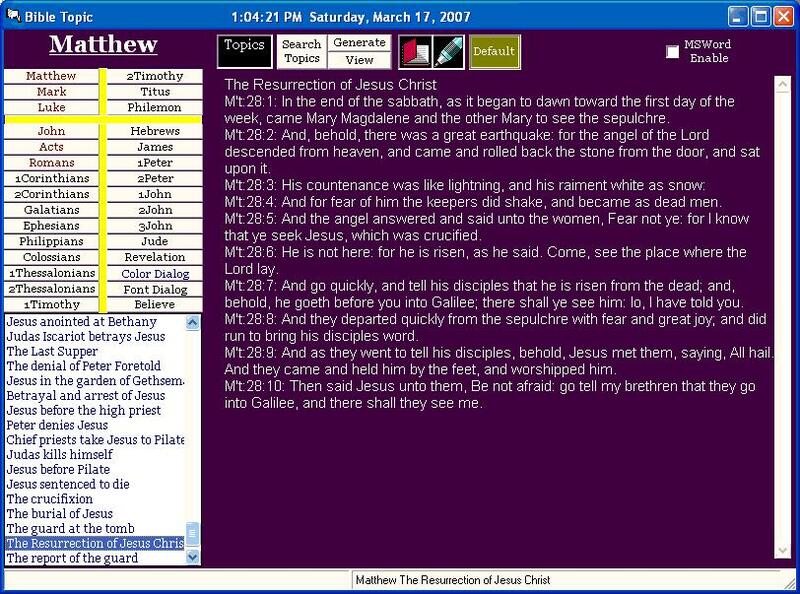 Display OT Messianic passages with coresponding NT scripture. Topics can be generated to a list. Display all or by book, sorted or unsorted. DblClk a word and the dictionaries will be searched. Tools for Easton's, Nave's and Torry's topic search. Gospel Parables. DblClk a word and the dictionaries will be searched. Select Proverb by Title or number. DblClk a word and the dictionaries will be searched. Search the Bible by Old, New Teataments, or by book. Search for a word, or Strong's number. DblClk a word or number and the dictionaries will be searched.